A werewolf is terrorizing Plainsville, but the townsfolk have not been watching any Lon Chaney Jr. movies lately and Mayor Hanson has to explain to them that silver bullets are required to rid the community of the foul fiend. When the next full moon comes around, everyone is ready. Mayor Hanson inspects his own house (?) and fires when he sees the werewolf, not realizing he's looking in a mirror. The rest of the rifle-toting townsfolk storm in and finish the mayor off. Jack, you needed to hide the mayor's face better! 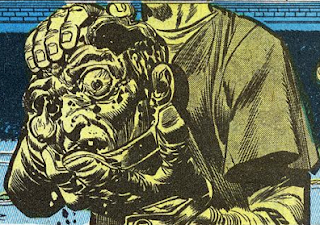 "Upon Reflection," the first story in Crypt of Terror #1, as the Crypt-Keeper calls it, is nothing new, and has all the hallmarks of a tired Carl Wessler script. The villagers complain to the mayor, blah blah blah, and in the end the mayor turns out to be the werewolf. I saw it coming a mile away. Unfortunately, Jack Davis was too lazy to draw the mayor from an angle that obscured his face, and when he's looking in the mirror he still looks human. Gunner Grunwald is the director of a home for the blind, but the residents are the least of his concerns. In fact, he has let the home fall into ruin while enriching himself. The poor blind people suffer with rats, roaches, and rancid food while Gunner lives in luxury. No wonder he bought a vicious guard dog named Brutus to protect himself! Finally, enough is enough, and the blind revolt. First they capture Brutus and lock him in a basement room. Then they capture Gunner and lock him in a room next door to Brutus. For the next three days, they hammer and saw, building something mysterious while the dog goes crazy with hunger. Peter gets dressed for another day at work. Finally, Gunner is set free, only to walk into a maze whose wooden walls are lined with razor blades. No problem, thinks he, I'll just walk slowly and carefully and watch my step. But then, Brutus is released, and Gunner has to run for his life. And if that's not bad enough--the blind folks turn out the lights. "Blind Alleys" is one of those EC stories I've been waiting for ever since we started this blog and, I'm happy to say, it doesn't disappoint on re-reading 40 or so years later. I remember it from the Big Book and from the movie, and it's no accident that it's a Gaines/Feldstein script rather than a Wessler script. Evans is the perfect choice to illustrate it and the last line is unforgettable: "And then some idiot turned out the lights!" 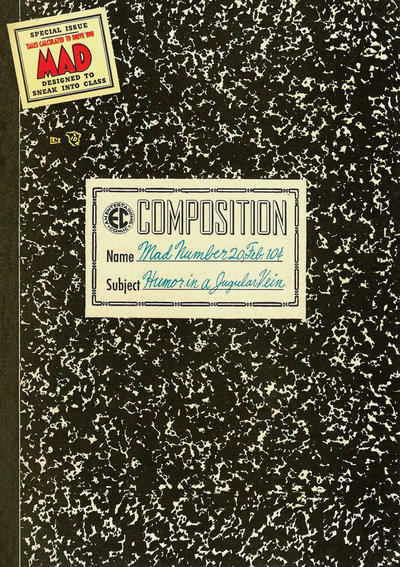 This is one of the best revenge tales EC ever published and it belongs in the all-time top ten list of EC stories. Recently married to a hot blonde, Elmer Preston can't believe his luck when her parents announce that they're giving the young couple $1000 as a down payment on a new house. Things are going well until Mom and Dad arrive on the doorstep and say they're broke and want to move in. It goes from bad to worse as they demand more and more from poor Elmer and soon even his wife joins in the never-ending litany of nagging and haranguing about why Elmer can't get ahead in the world. The poor sap finally snaps and cuts off their heads. When the police come and he tells his story, they marvel at the severed heads arranged in platters on the dining room table. Got ahead... oh wait, *now* I get it! The high I got from the previous story was short-lived, as we're immediately brought back to Earth with another Wessler tale that goes from A to B to C with no surprises. "Success Story" is one of the most uninspired revenge tales we've read. Orlando's art is not appealing either, and the best I can say for this tepid tale is that they don't shy away from the ending, as things get pretty grisly with the cleaver attack and the heads on display. Why would handsome, young Tony Barrett marry an old hag like Fanny Ogden? For her money, of course! A stranger told Tony that Fanny has $100 grand stashed away in her house and he's determined to find it. 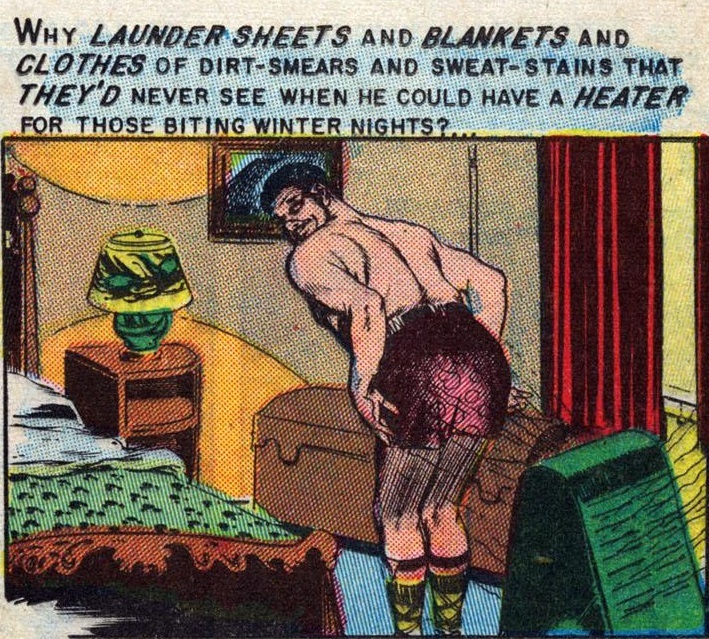 As the months go by, he is more and more repulsed by his wife, who spends much of her time gathering up rags to sell to the ragman who stops by on a daily basis. Tony finally has enough and murders his wife, burying her body in the basement. The ragman keeps coming and, when Tony runs out of rags to give him, the tattered fellow heads down to the basement and wants the clothes from Fanny's corpse. It turns out he was Fanny's lover but knew she needed a strong, young man for a husband, not a ragman. 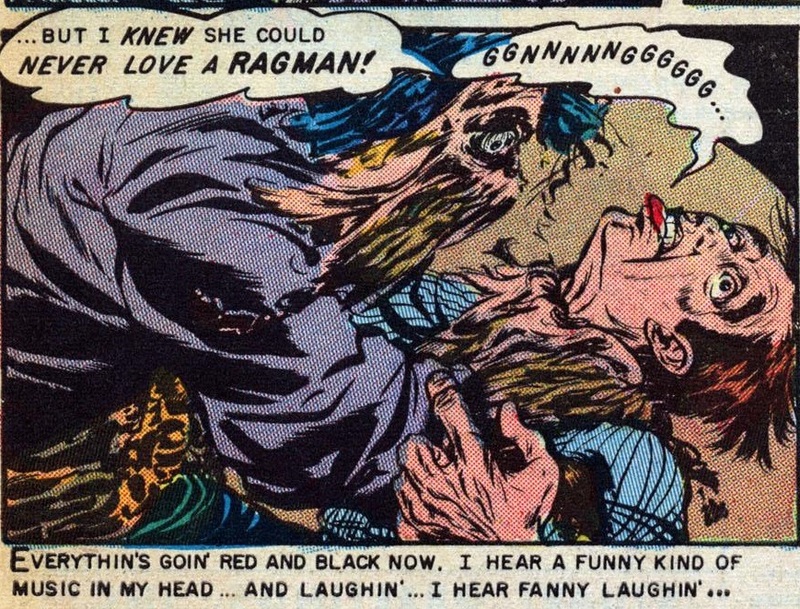 Ragman... oh wait, *now* I get it! 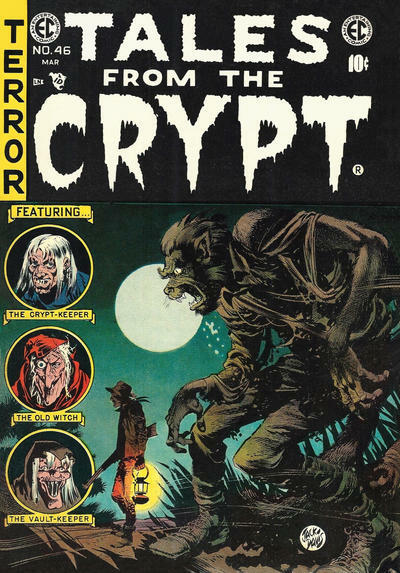 Peter: Tales from the Crypt #46 is a milestone for several reasons, the most obvious being that it's the last horror comic EC ever published. 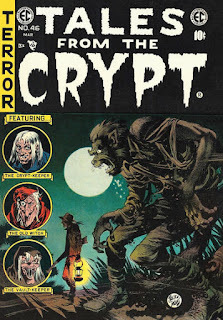 Interestingly enough, #46 was originally assembled to be the premiere issue of a fourth horror title, The Crypt of Terror, before the horsemen of the Senate apocalypse rode into town; the intros were not even changed as Bill Gaines was in such a rush to get this thing out the door. It's also the last time we'll see Graham Ingels sign his name, "Ghastly" (from here on out, it's simply "Graham"). The final important note on my checklist belongs to "Blind Alleys," which is the last of the Amicus adaptations we'll get to on this journey. I have to say that I prefer the filmed version (found in Tales from the Crypt) to the original. 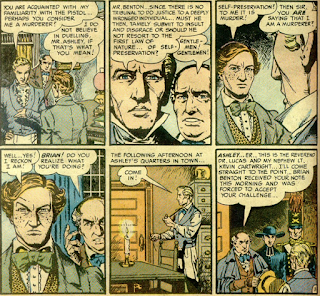 The character of Gunner Grunwald (Major William Rogers in the film, played nicely by Nigel Patrick) in the comic version is a mean-spirited, sadistic sumbitch, almost laughably so, while screenwriter Milt Subotsky's take on the asylum director is more "human" (while retaining the penny-pinching side of the character), avoiding such silliness as tripping or dumping buckets of water on the heads of his charges. Subotsky gets it: you don't have to go Jerry Lewis on your audience to get them to hate this guy. Having said that, I still like the original quite a bit and it's certainly helped along by George Evans's art and that classic final line. "Success Story" is the perfect tale to serve up to someone if you want to show them what was going wrong with the line, dredging up bad plots and twists endlessly. "A-head! A-head!" Get it? Yeah, I got it halfway through the story when you pounded me over the head with it. "Upon Reflection" is also short on surprises (except, perhaps, the sight of a werewolf in a blue suit and cape). Funny that only Elwood Hanson's reflection looks like a werewolf! So what about that final Ghastly goodie? Ugh! "Tatter Up!" 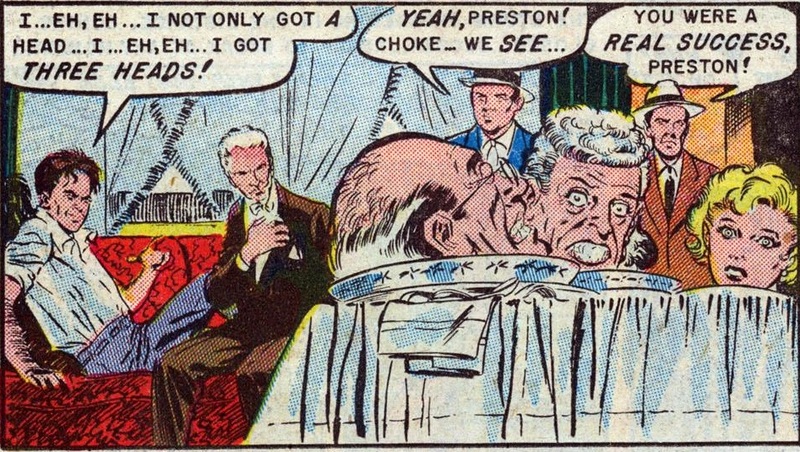 is yet another variation on the young man courting the rich old ugly woman, this time capped by a nonsensical climax (if the guy's made of rags and his hands are "soft and stringy-like," then how is he supposed to strangle Tony?). Ashley: Since there is no tribunal to do justice to a deeply wronged individual . . . must he then tamely submit to insult and disgrace or should he not resort to the first law of nature . . . of self-preservation? Brian: Self-preservation? To me it is murder! Ashley: Then sir, you are saying that I am a murderer? Brian: Well . . . yes! I reckon I am! 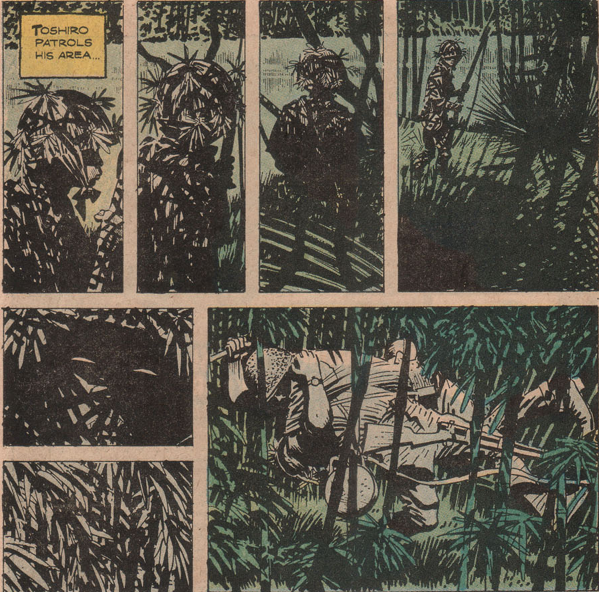 Though the GCD lists John Severin as his own inker, I think he had some help; his lines are a little softer and rounder than usual (still great work). This here's the best story we've had in Two-Fisted since Harvey headed for MADder pastures. Jungle picture director Merrill Quantock arrives in Nairobi to film his most exciting and authentic documentary yet, a study of the "Mau Mau!" tribe. To aid him. Quantock hires only the best, including big game hunter McBan and Mau Mau expert, Limuru. Once in the jungle, McBan hires a native named Hinga, who seems to be a whiz at fixing anything mechanical, but Limuru and Quantock believe Hinga to be a Mau Mau in disguise. The cameras roll and Limuru provides several natives for "set dressing," but it's soon revealed that it's Limuru, and not Hinga, that is the Mau Mau! Most everything Bernie Krigstein works on is a page-turner, but "Mau Mau!" is curiously dull and confusing. The twist is predictable and the secondary character of McBan doesn't serve much of a purpose other than to stand off to the side and look grim. Krigstein's work is cartoony (a la the similarly jungle-set stinker, "Numbskull," from Haunt #28) and far from the experimental style he excels at. 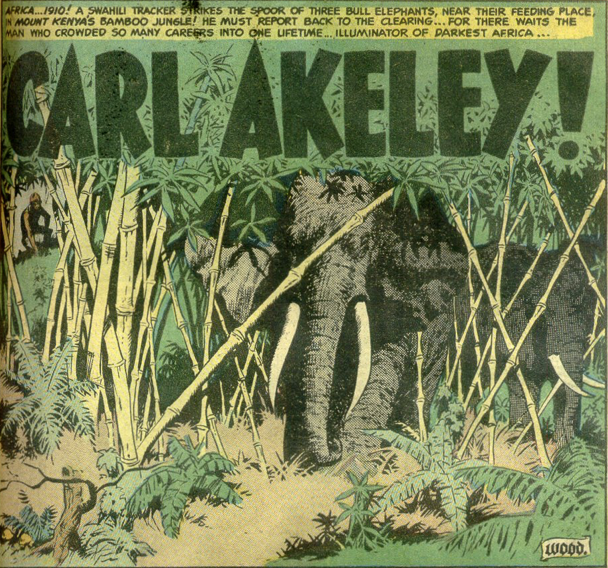 "Carl Akeley!" is an interesting and beautifully illustrated docu-drama about the noted early 20th-century taxidermist and adventurer who fought wild animals and lived to tell the tales (and then was struck down, ironically, by a malaria-carrying mosquito). As with many of Harvey's "lectures" in the early days of Two-Fisted, "Carl Akeley!" enlightens those of us who are ignorant in the ways of history and the men who shaped that history. Wally's work, especially the bull elephant sequence, is nothing short of thrilling. A change of pace in that there is not one line of dialogue, with the story being told only in captions and images. World War I pilot Bill Stone is "Yellow!" and, at first, he couldn't care less if everyone knows it. But when comrade Curry makes a comment about one of the pilots being a coward, it raises Stone's hackles and he becomes an ace. After a particularly grueling mission wherein he saves Curry's bacon, Stone confronts his ally with the news that Curry's comment about cowardice turned Stone's entire demeanor around. Curry shocks Stone by confessing that he was actually talking about himself being the weak link! Jack: I found Kurtzman's editorial heartfelt and thought it interesting to read that so much research went into these stories. While I liked Severin's story, it seemed overly talky and oddly lacking in action and suspense, with an abrupt finish. Krigstein's story features some of his most straightforward art but the narrative is unengaging. Wood does excellent technical work but the story is kind of dry, like something from a Gold Key comic or the Sunday funnies page. Evans saves the best for last, as his rich air battle work lifts an excellent story into the air. For over 900 years, a giant ship has hurtled through space. It contains 556 men, women, and children--all that remains of the human race since Earth became uninhabitable. They have survived all these centuries in an environment where all of their needs are met by carefully tended machines. Now, as they approach the Earth-like planet of Procyon-5, excitement mounts at the prospect of finally living normal lives in the open air. The ship lands and the young people pour out of it, but the older ones are afraid to leave the safe environment that they have known for so long. Very soon, the young folks find that life in the real world can be uncomfortable and frightening, and they head back to the safety of the ship and blast off back into space. A nice sequence by Wally Wood. 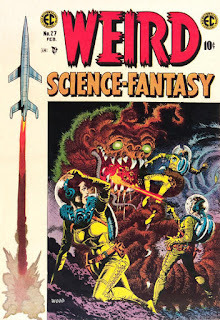 "Adaptability" is a fine science fiction tale that is made even better by gorgeous art by Wally Wood. 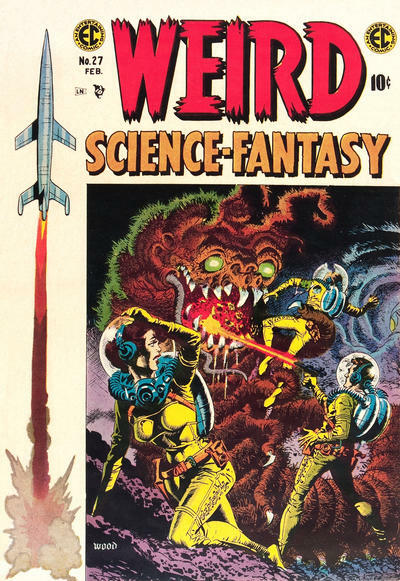 Wood could draw any kind of story, but somehow the science fiction and fantasy ones seem to have piqued his interest and made him work harder to craft one brilliant page after another. In the 25th century, handsome Jay Ellison tells his fiance, Vida Orkney, that he is unworthy of her hand in marriage. She thinks back to how they met, when he saved her from being run over by a speeding car, and how they fell in love, as she witnessed his brave acts of standing up to bullies in public. In this future society, Ganymedes are covered with fur and persecuted. Some have been engaging in a particularly "Close Shave" and passing as humans. Jay admits to Vida that he's a Ganymede and has been shaving down and hiding his true self from his beloved. She laughs and tells him she's also a Ganymede, so they can be wed. Later, when she's alone, she realizes that she must destroy the picture of her human parents so he never finds out she's lying. 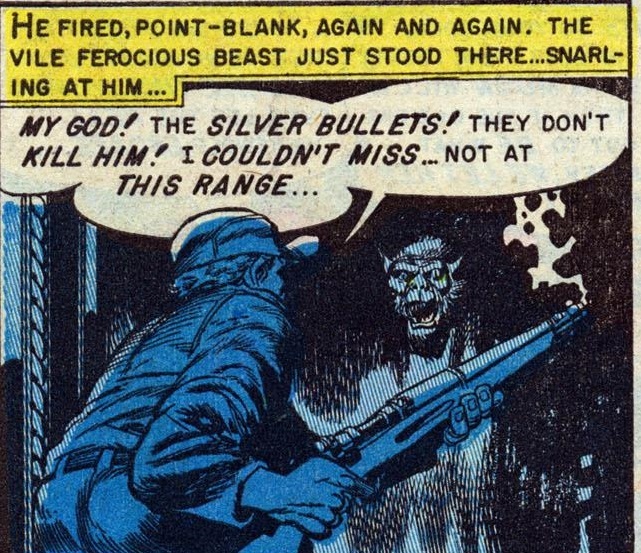 Otto Binder writes some very wordy comic book stories, doesn't he? This and the one before it take a bit of time to read but are worth it. Reed Crandall is a superb comic artist and this story progresses nicely through its twists and turns until the final revelation. I like the depictions of the hairy Ganymedes, too. A decent panel from our favorite punching bag. In the year 2039, Val Draper is a romantic among humans who are devoted to the state. His girlfriend, scientist Andrea Coles, has invented a time machine and he convinces her to send him back to 1954, before the Atomic War destroyed all countries and the people were enslaved by the world government. 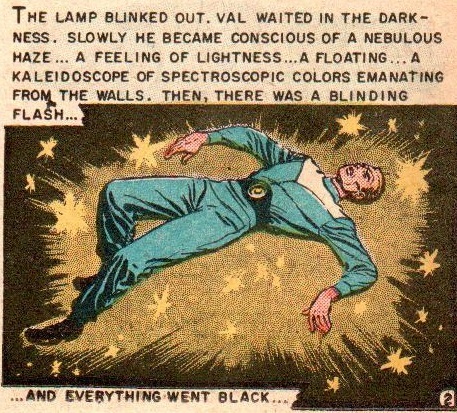 Having heard enough, the doctor from 1954 reveals that there is no time machine and Val is still in 2039, where he was tricked into giving testimony against himself. He is taken outside and shot. Inside, Andrea reads one of his forbidden books from the past and weeps over the thought of a world where love existed. Bill Gaines was surely smarting from the comic book witch hunt when he wrote this tract, which is overly preachy and lacks subtlety. 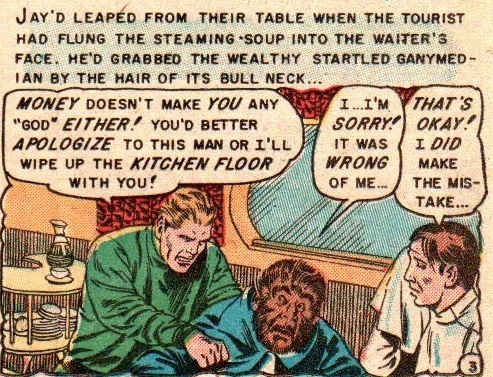 For Gaines, the world of 1954, where people could not speak as freely as they could ten years before, was heading toward the world of 2039, as depicted in this story. He was right, of course, but the story is a dud and Kamen's art doesn't help. Adam Link, a robot built and trained by Dr. Link, writes his memoirs, recalling how he was first given life and how he learned and retained knowledge. 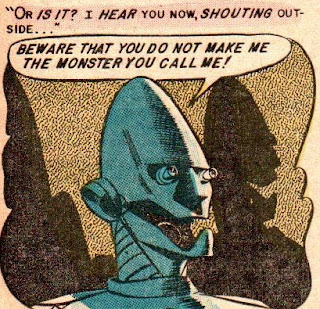 When Dr. Link is killed in a lab accident, the robot is blamed and hunted, much like the Frankenstein monster. In the end, he chooses to switch himself off rather than harm any humans. Peter: I liked "Adaptability" a lot but think Otto should have ended it with the young folk having a hard time adapting to the new atmosphere and racing back to the ship like spoiled children (some things never change, do they); no need to throw germs and icky stuff in there as well. The hand is certainly heavy in "Close Shave" (I thought for sure that, in Vida's list of intolerances--"witch hunts . . . anti-semitism . . . racial intolerance . . ."--we'd get "Senate subcommittees," but no!) but the final panel double-twist is pretty clever. What's this? The return of Gaines and Feldstein? Time to celebrate? Hardly. "4th Degree" is a cliched snooze with perfectly matched art. Why does the "government" go to such extremes to fool Draper when all they had to do was execute him? 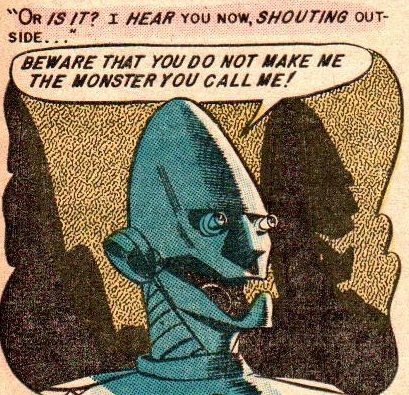 I've never cared for Adam Link, in any of his incarnations, be it prose, comic, or TV show, and this version of "I, Robot" (the first adaptation, I believe) is no exception. There will be three adaptations over the next three issues, all illustrated by Joe Orlando. An interesting footnote (certainly more interesting than the story itself) is that Binder and Orlando re-teamed in the mid-1960s for a series of Link stories published in Warren's Creepy. Hans and Feetz, the so-called “Katchandhammer Kids”, are not unlike any other German child, fitted with a lust for violence and causeless retribution. Their target of choice is the buffoon Kapitan, who falls to prey to all manner of their intricate MacGyver-meets-Home Alone antics and deathtraps, including the use of a cat, a dog, a mule, an uncorked champagne bottle, and strategically-placed garbage to perpetuate the illusion that the Kapitan is a stinking drunk to an esteemed guest. The Kapitan responds in kind by whaling the ever-loving hell out of the two terrors, much to the chagrin of the Inspektor, who warns the Kapitan that brute force will only lead to more deviltry on the part of the kinder. Years later, it turns out the Inspektor’s words have rung true: now young men, Hans and Feetz have grown into a pair of honest-to-goodness cutthroat criminals! We're two wild and crazy guys! Like a number of comic strip parodies from previous issues of MAD, I’m not familiar with the source material here, but then again just as before that foreknowledge isn’t really necessary as Kurtzman and Elder are operating on their own bizarro wavelength here. My opinion of “Katchandhammer Kids” falls somewhere in the middle of Peter’s and Jack’s evaluations: I appreciate the gonzo and anything-goes nature of the humor—the chicken fat quotient runs especially high here—but the faux German dialect becomes a slog to get through at certain points and at times shortchanges the comedic punch. Overall, I certainly feel more cultured for having read it, though I suspect that that’s not really the effect the boys were going for. Hey, kids! Dontcha just love those big ol’ gobbledy-gook “Sound Effects” that you find in your funny books? So striking and bold and all over the damn place! You hardly need any narrative exposition or dialogue to tell a story when you got sound effects on your side! And that’s just what Kurtzman and Wally Wood set out to do here, to rib-tickling effect. There’s really no way to synopsize this little bit of winking meta-humor; the glee lies in the reading. Suffice to say that the duo uses the boilerplate template of a detective noir to incorporate all manner of onomatopoeia and aural cues, whether they’re of the familiar variety (THUNK, BLAM, etc.) or of the never-knew-that-was-a-sound variety (BLEED, CRAWL, etc.). Only in MAD could one find a story like this, willing to break free from the mold EC had set for itself and just take part in some light anarchic goofery. Hey, kids! Dontcha just love those long, boring poems your teachers force you to recite and suffer through in English class? Wouldn’t it be great if those poems were set to illustrations that could be considered humorous only by the broadest definition? Then have we got the funny book story for you! I can only imagine that Harvey Kurtzman kept returning to these poetry parodies because they were easy enough to use in order to fill out some six-page real estate; *none* of them have been up to the comedic standards of his other work, and they’ve *always* been the low point of whatever issue they appeared in. The same is true for “Paul Revere’s Ride”, which finds Jack Davis being forced presumably at musket-point to draw some “hilarious” panels of a pint-sized Revere chasing after his horse and stealing some chickens. I would’ve preferred that they just ran the original unabridged poem instead! Oh man, here comes the milk out of my nose again! Peter: "Katchandhammer" is the latest KurtzElder classic, a strip so blatantly goofy it almost defies description. 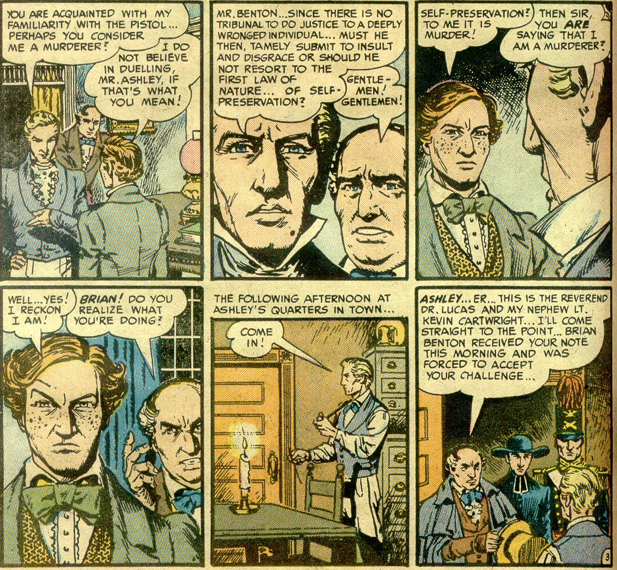 You keep waiting for the faux-German accents to drop off but, no, the lunacy continues right through the final panel (with even the page numbers getting in on the act). The intricately plotted gags are hilarious; KurtzElder's success at aping these strips is insanely funny. The same cannot be said about the rest of the issue ("Cowboy!" is spot-on with its dissection of the myths but that doesn't make it funny), which is about as funny as putting on the evening news. Still, if KurtzElder can keep their train moving down the tracks, that guarantees at least a handful of guffaws every issue. 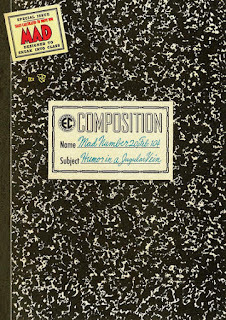 Jack: As I slogged through these four stories, I began to wonder if there's much benefit to re-reading Mad 63 years after it was first published. 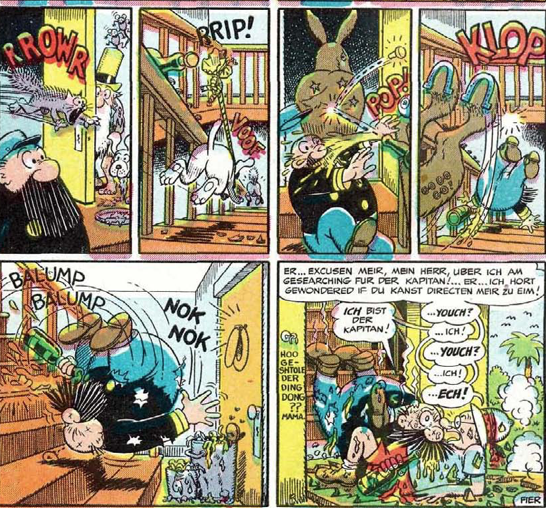 You do have to hand it to Kurtzman for having the nerve to write that whole first story in pidgin German, but that doesn't make it fun to read. The cover is brilliant and I could see bored kids poring over every "German" word balloon in class, but do we have to as well? "Sound Effects!" was my favorite story this time out, both for the Wood art and the private eye theme. It struck me that it's not that different from one of those 2018 comics with little dialogue or narration. The last two stories are more Jack Davis than I can handle in a single sitting. Neither one is funny, and Kurtzman is leaning awfully hard on the theme of comparing artifice to reality. Was für seltsame Unsinnigkeiten diese sein? Ich muss lachen mein Arsch ab! Star Spangled #130 . . .
Just how good is Alex Toth? Which stories did I miss? These seem to be the most (in)famous as far as EC horror tales are concerned. This doesn't seem much, but I have to confess I would have a hard time to do the same for the DC anthology books and the Warren books. I agree that "Yellow" is a fine last story for the great Two-Fisted Tales (which ran for 24 issues, by the way, not 29). 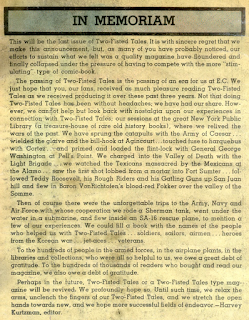 George Evans wrote a nice story for himself. 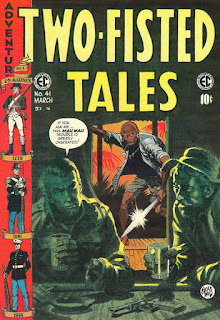 In the past twenty years I have almost never read comic books other than re-reading copies of the five titles that I loved as a kid and that I have spent the last thirty years or so collecting -- Two-Fisted Tales, Frontline Combat, Mad, Shock Suspenstories, and Valor. But, inspired by your blog, last month I bought a copy of the EC Archives collection of Aces High and went through it (I'd do the same with Piracy if Dark Horse would put out a collection of that title). Evans's covers and inside art with his beautiful World War I fighter planes are all fantastic, but the quality of the stories themselves vary significantly. Other writers wrote all of his stories in Aces High; it would have been nice if Evans had written and drawn a couple for that book, because he did such a nice job in the last two issues of TFT. Andy, Peter and Jose know more about this than I do, but I always go back to the Big Book (Horror Comics of the 1950s) and the 2 anthology films from the '70s for the most well-known horror stories. "Strop, You're Killing Me" left a lasting impression on me, as did the one by Crandall where the vulture plucks out the guy's eye in the desert. These were disturbing things I couldn't get out of my young head, kind of like when I saw Un Chien Andalou and the scene with the eyeball getting sliced. Jim, I'm glad we inspired you to buy more comics! Doing these blogs with Peter and Jose has made me get back into comics after many years of not reading them all that much. I'm even reading some new ones, though the cover prices still give me sticker shock. I bought all 6 issues of the new Deadman by neal Adams on Free Comic Book Day but I haven't read them yet. Andy: if we’re talking quality, I think most would put Judgement Day, A Sound of Thinder, My World and Home to Stay on that list from the sci-fi comics. Horror We? How’s Bayou also has quite the reputation. Squeeze Play as well. I'd be able to come up with 15-20 DC horror stories and at least double that from Warren were someone to ask. In terms of quality, I think Warren (at least in the very early years and mid-1970s) was right up there with EC. Thanks for letting me know my 9 is in the wrong place on my keyboard. Yes, I knew its was 24 but couldn't quite make the jump from brain to finger. And thanks all for reading and commenting! Even you, Jack. It is depressing to see you finally come to the end of the EC horror comics. They remain to this day one of the two titans of my comics fandom (the other being Warren, as you may be able to tell anthology horror is my niche). While the quality certainly did drop around the end, it was an amazing 5 year run by them and they still remain memorable to this day. You've done a great job covering them here and I'm sorry that we won't have more from you on them, but at least we have the New Direction (and hopefully) the Picto-Fiction still to come. Some may argue EC's single best story is still coming up (which you will be upon very soon). 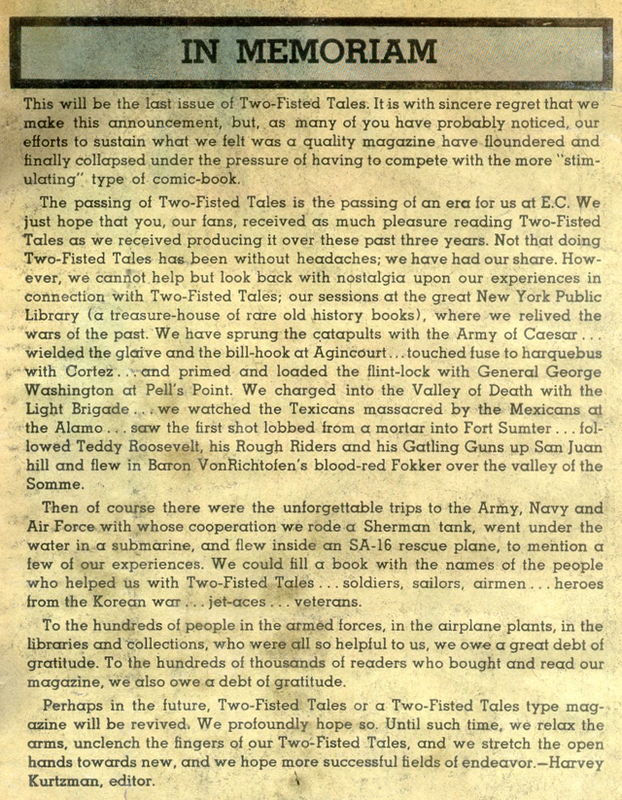 As for the final issue of Tales from the Crypt in particular, I generally share your attitudes about it, the first and third stories in particular are quite a waste of time. Blind Alleys is an all time classic. The ending line you enjoy so much is actually somewhat Bradbury inspired. One of his earlier stories (The October Game, which was adapted in Shock #9) ends with "And then some idiot turned on the lights", so they do the opposite here to end this story and have them turned off. In addition to the Tales from the Crypt movie they actually adapted it for a Tales from the Crypt episode as well although took the title from an unrelated story, "Revenge is the Nuts". Somewhere around that era in the show where they stopped caring about being faithful to the original comic stories. As for "Tattered Up" I've always enjoyed this story a lot if only because the ending is so ridiculous and over the top, and it is our very last Ingels horror story, at least in comics form (he did have several Picto-Fiction stories). That's not even a rag man in the last panel, it’s like his face is melting or he's a rotting corpse. Totally nonsensical. Missed this in my prior post, but I too could pretty easily come up with a list of top Warren stories. As good as EC was, Warren was even better in my eyes, of course a lot of that was their ability to totally break out of the rigid format that EC had put itself into with its 4 stories per issue, 8/7/6/7 format that they simply would not stray from, no matter what. And the genre had matured considerably in the years since EC came to an end. I definitely hope you consider covering Warren once you are fully done with EC! Maybe I let color my opinion of Warren from re-reading too much of Vampirella. I bought the Dynamite reprint for pure nostalgia, and after a while I mostly looked at the wonderful art and ignored the purple prose which I mostly either thought pretentious or just unreadable. Not the Vampi stories which mostly couldn't be taken too seriously to begin with, but the rest. I sampled a few Eerie and Creepy reprints and also thought them mostly hard going. When I was 16 I thought them among the most mature and edgy comics on the market. It was really long ago. I am with Quiddity. :-) A Warren write-up would be great.